I hope you all had a wonderful weekend. We had a really nice weekend but unfortunately one of the main items on my to-do list didn’t get done. That was “clean craft space.” I used one of my craft tables as my study space while I prepared for my HR exam so I finally put away my books, notes, etc. 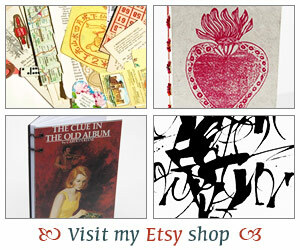 but a lot of my craft items (projects in progress included) are lumped all to one side. It’s not pretty. So, that is something i need to do before I start crafting again otherwise I’ll probably just spend time moving things around and not really creating anything. Anyway, we made it out to Barnes & Noble for an afternoon and I discovered Crafts Beautiful magazine. 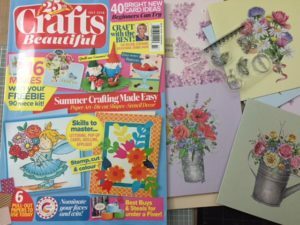 I always see several sealed magazines and don’t pay too much attention to them until I realized that these craft magazines are sealed because they have crafty freebies! Where have I been? Needless to say, I had to get one to check it out. I was happy with my purchase mainly because I got to see some of the craft lines that are available in the U.K. From what I’ve heard in the crafty community in the States you can find a lot more and especially with regards to stuff on sale but it is still fun to see what is available in other places. I know when we go to Germany I always enjoy visiting idee which is a big craft store in Hannover. So there are a lot of other things I need to catch up on the blog as well (I have about five mini reviews coming soon) but for now I need to close here and go finish my book for my mystery book group meeting. What fun: treats sealed in those bags?! I’ll be watching for those on the shelves now, too, just to admire, not to purchase. Good luck with the remainder of your cleaning duties: it’ll feel good when you’re done and back to crafting.